3 Fellhill Street as a three bedroom end terraced villa situated in a popular residential area close to local schools and transport links. The property requires a degree of modernisation. The living space comprises three bedrooms, lounge/diner, kitchen, downstairs WC and family bathroom. 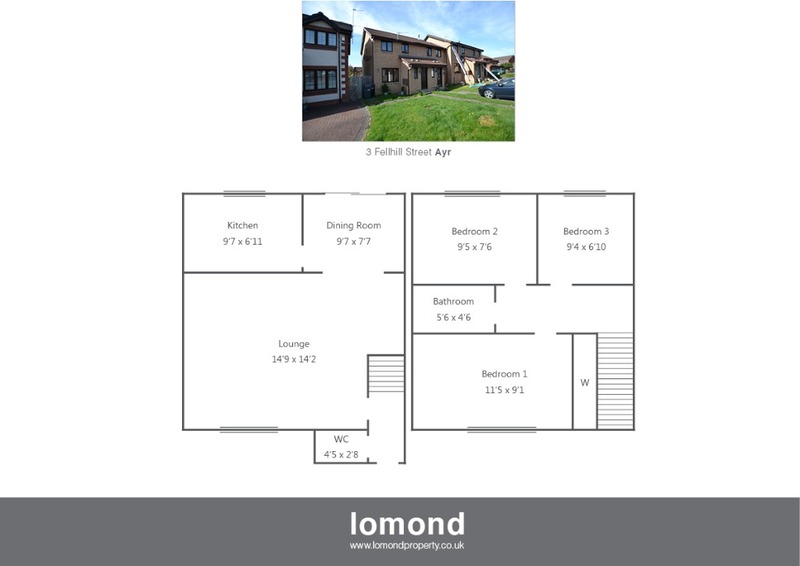 Externally the property comes with off street parking and private rear garden. In summary the property extends to an entrance hallway with downstairs WC. The living space comprises of an open plan lounge/ diner with patio doors to the rear garden. The kitchen completes the ground floor accommodation. The upper level houses three bedrooms, two of which are doubles, and a family bathroom the master bedroom comes with a fitted wardrobe space. Externally the property comes with a street parking and private gardens to the rear. Fellhill Street is a pleasant residential area. Ayr town is close by and provides access to a range of amenities including supermarkets, bars, restaurants and town centre shopping. There are a number of local primary and secondary schools within the greater Ayr area.